Brandon Riechers has spent literally half of his life working at Royal Credit Union, beginning in 1996 as a 21-year-old part-time financial sales representative in the office at Golf Road and Highway 93. 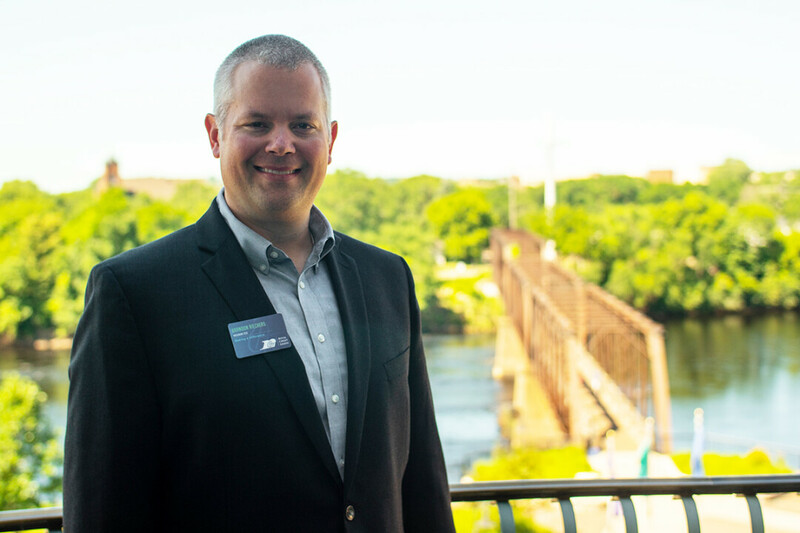 Over the course of more than two decades, he rose through RCU’s ranks until last July, when he became president and CEO of the Eau Claire-based credit union. His fourth-floor office in RCU’s headquarters offers a remarkable view of Phoenix Park, the soon-to-open Pablo Center at the Confluence, and the rest of the city, but during his career the credit union has expanded far beyond the city where it began: It now has more than 190,000 members in 42 counties across western Wisconsin and Minnesota. Riechers – a North High School graduate and UW-Eau Claire alum – said shortly after he started working at RCU he realized he could make a career there. “Throughout my career – and I tell people today – luck is really the result of opportunity and preparedness,” he says. Riechers recently chatted with Volume One about how RCU has evolved, what it offers to the community, and what the future holds. Brandon Riechers: Pretty much when I graduated college and got into my work, at that time, at the contact center. It was certainly a place I was looking at that had career possibilities. There were certainly opportunities. We were a progressive, growing organization, so at the time we were just over 100 team members, and now we’re over 600 team members. You think of the growth that it takes to do that in 20 years, there were lots of opportunities and possibilities for career advancement. So I certainly saw it as not only doing great things in the community and not only having a great culture internally within the organization, but there was just lots of opportunity. What have you learned about the institution and role of a CEO in the past year? One thing over the last year, it’s hammered home the need to listen. I held listening sessions right out of the gates when I took over as CEO, and that was with team members, that was with community leaders, that was with a variety of people – (such as) business clients – listenings for ways we can improve, because even as successful as we were as an organization, I knew there were things that we could be doing better. I think when you’re in a position like this, you always have to be looking for those next, new ways to improve the organization. Because the moment your member base, your customer base, no longer thinks there’s value to what you’re providing, that’s when you start to slip. RCU has a strong relationship with the Eau Claire community. Your headquarters help anchor Phoenix Park and other development downtown. What do you see happening to that relationship going forward, especially as the organization has grown geographically? How do you maintain the local focus? One common denominator throughout our growth has been strengthening the communities that we’re in. We always want to be a strong community partner in any community we are. ... The fact that we’re expanding out gives us greater scale to give back at a greater level. And that’s one of the reasons we started our foundation. Now we’re giving back through our foundation as well, and a lot of those types of gifts are focused on – basically a lot of our gifts, unlike some foundations, they can be for capital buildings, they can be for community centers that bring people together, so we’re looking for ways to educate people, bring communities together, and promote that collaboration that will in turn resonate throughout the community and help the community grow. What are things about the credit union model in general or about Royal specifically that people might not understand or appreciate? I think that in answer to your question also is the community giveback. Things like this foundation we’ve started. And last year we had our first Community Give Back Day where we closed for a day in the offices and all 600 team members were out in the communities giving back. … We just came off of our Clarity Classic event which has now turned into Rock the Riverfront. It used to be just a race, the RCU Charity Classic, and now it’s expanded in nature, similar to how all the downtown activities seem to be expanding. Talk a little about Royal’s recent growth and how that has occurred. What opportunities has that opened up? (In addition to) the expansion in the Minnesota market, we’ve actually seen growth in our home base market here in Eau Claire, too, so we continue to grow market share in our home market, staying not just relevant but also competitive on the technology front, offering new technology to make it more and more convenient for people to transact business through mobile banking. … Transactions are increasing exponentially through the smartphone, which is where everyone is conducting their business these days. When you started working at Royal, you were at an age when people are generally first getting their feet wet in spending money, having money, or not having money. Do you think working for a financial institution helped you avoid some common money mistakes that young people make? I think it helped. Being on the financial industry side of things, it was eye-opening to see how much education was needed out there, which was why that has been such a large component of what Royal Credit Union does, from the School Sense program to our community education we do on financial education. Just in the last year alone, we’ve taught 700 presentations to nearly 10,000 students – and that’s outside the School Sense program, where we’ve got the 27 branches within schools, soon to be 28 in the Chippewa Falls Elementary School. I think financial education is hugely important, more so today than ever, as consumer debt is increasing at historic highs. When many of us think about borrowing money, we think only about homes, cars, and college, but there are obviously other times that it makes sense to get a loan. What other loan situations should people think about? I think one area is if you have equity in a house that you own, certainly a home equity line of credit is an option to have. You pay no interest or fees to have that line out there, and when you do use it there would be the normal interest rate at that time. That can be for anything from a house remodel to emergency funding gaps, but that’s a good option for somebody if they have equity in their home. We’re trying to promote savings from the standpoint of financial education, getting people excited about savings. ... If we can make it more goal-oriented, where you are saving up for a down payment on your next home, or a down payment on your car, then if you do run into that emergency funding gap, your car breaks down, (or) you have a health issue, you’ve got something to pull from before you’re getting into your day-to-day needs funds. Again, I think savings can be kind of like a diet: If you’re just approaching it on a short-term, it’s easy to go back on your old habits, but if you’re creating a short-term or a long-term goal with something purposeful behind it, it’s much easier to be disciplined about saving for a cause. How does someone go about getting that discipline? One of the easiest ways is to set it up as an automatic transfer. Maybe if a portion of what you’re paying on your loan amount – whether it be a mortgage or car loan – say you round up, and whatever amount then is also going to savings. It’s sort of a “set it and forget it” type mentality, where you’re thinking you’re paying this full amount to go toward your car loan or your home loan, but in reality it’s setting up this savings for whatever this goal is. That’s about the easiest way. Oftentimes if it’s happening automatic with regularity, it creates that habit of you’re not missing the money on a day-to-day basis, so it just goes on to accumulate. You worked in lending a long time. Are there other things you saw frequently that you wish people had done before they sought loans? I think certainly down payments, whether they be for cars or houses, when a person saves up for a down payment in those situations, not only does it improve their success rate in getting a loan, but it also can sometimes reduce the rate or the fees associated with that mortgage or that car loan. So, again, saving up for, planning for, that eventual event is always a helpful tip. I think anyone who has ever found themselves in a burdensome credit card debt situation, there are credit card consolidation options through places like Royal Credit Union that are at a greater benefit to that person than say if they went through a finance company, for example. Both rates and fees again typically are going to be lower than what you’d encounter elsewhere. … Last year there was a survey that said almost 80 percent of full-time employees live paycheck to paycheck. That doesn’t allow for any sort of emergency gap funding as we talked about earlier. So when that emergency does come up, seeking a traditional option such as a local financial (institution), rather than seeking payday loans and payday lending, can be an option that sometimes is easier to get back on your feet than it is if you’re in that spiral of payday loans. Now that you’ve been in the job a year, what are the goals you have for either yourself or for Royal as a whole over the next few years? Starting with investments in technology, we need to continue to make it easier to do business with Royal Credit Union. We want to reduce friction, we want to reduce barriers. … Another facet to that is evaluating our existing data, all the things we know and figuring out ways that we can personalize and customize solutions to each of our members, kind of going back to how we can offer advice, or how we can help people reach their goals. ... As far as other goals we have, I have personally, continuing to develop our team members so that we have the best talent we can find out there. We’ve got a goal of high-impact talent, and that means both developing our internal people as well as recruiting the best talent we can.